We are in love more than ever with our mobile and… ourselves ! It’s become our first love, unique love most of the time, the most trusted friend and, the only one we can rely on with our deepest secrets, confidences, and inner thoughts. Only the shape of our mobile changes over the years (just like us!!!) but it stays loyal to us. We are inseparable, committed for better and worth. No divorce. It’s a marriage for life! 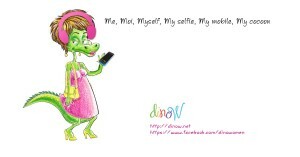 Our mobiles are our new darling pets. Our most trusted BFFs (best friends for ever). They are dearer to us than our partners, relatives, colleagues.., you don’t believe me? Ever forgot it somewhere? Or worse, lost it? You freak out, get a panic attack, frantically beg everyone around you to help you look for it, refuse to answer any sane question, running around in a state of delirium until you find it…or not! In this case you buy a new one in the next 2 hours. You get separated from your kids, partner or family during the day but you never separate from IT. Even at meetings, restrooms, plane or in your bed, it’s always close by. Sometimes silent, asleep or snoring softly but always by your side. Your alter ego for life. You check on it more than you check on your babies’…kids!!! Why? Simply because every second of our lives is vibrating (pardon the pun) in this mobile. Our contacts, friends, social life (Facebook, twitter, Instagram), mails, reminders, agenda, texts, messages, family pictures, internet, are there. Even if we go out, party, dance, dine, our real social life lies in our mobiles. It’s our safety net when we’re waiting for someone to come, a meeting to start, anywhere where were we find ourselves in a crowd with strangers and do not know what to do with our hands. In the old days the cigarette gave us something to do when we felt out of our depths in a situation. Now we grab our mobile like a life saver and find immediately something to fill the time, the void. We have created our cocoon, our very private yet very public world. We are lost without it and wonder how we did in the old days. Stop texting for a second and take a look around you during the day, at night, in your family or anywhere around you. What is the percentage of people having a conversation compared to the ones engrossed with their cellphones? Surreal! Yet a few years back we actually had conversations and were able to spend the day without frantically looking for our mobiles. Now the self-love is at its peak. Selfies have invaded the world and filled it with our pictures who are only appreciated by…our moms. The rest of the world is fed up with this new race, new self- adoring “Narcisses” , their preaching, “inspirational drawers’ philosophies”, especially deep thoughts about life, love, hate, success and the likes. Pllllease let’s leave the preaching to priests or mentors, the philosophy to philosophers and the psychology to its own specialists. Let’s avoid drenching everyone with thousands of videos and pictures of our kids, families and OURSELVES every single day of the year.